Phew, what a thrilling couple of Scottish League Cup semi-finals. And, after all that, it is Motherwell who have surprised many pundits by taking their place in the final on 26 November against holders Celtic. Before then, there's lots of football to be played and the games come thick and fast in the Premiership. So join us on Tuesday, when the Edinburgh derby, with Hibs hosting Hearts, takes top billing, while Partick Thistle visit Hamilton Accies and St Johnstone are at home to Ross County. Here's Roddie McVake's take on Motherwell's victory over Rangers at Hampden. 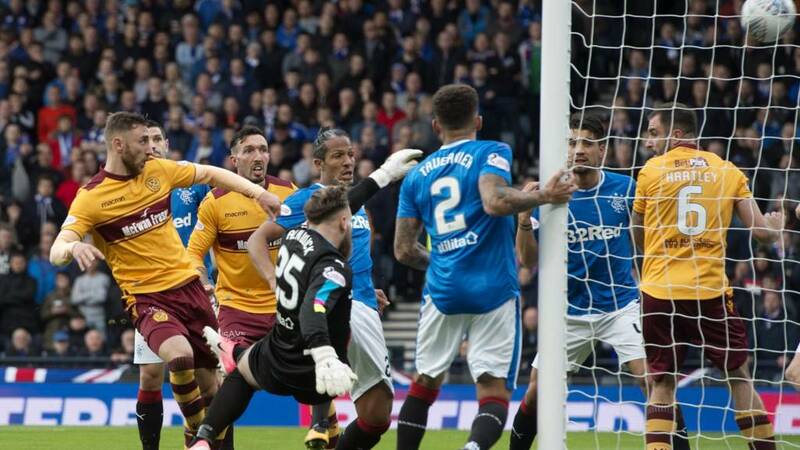 Louis Moult's predatory double takes Motherwell into the Scottish League Cup final after a fiery battle with Rangers. Rangers manager Pedro Caixinha told BT Sport he accepted the blame for the defeat but evaded a question about his own future. "We didn't manage to cope with the expectation," he said. "We let the opponent play the way they wanted. "We got a little better in the second half, we had a couple of chances to score, but after the second goal, we just disappeared as a team. "Overall, it was a poor performance from us. We were here to deliver to our fan-base the present of a place in the final and we haven't. I am responsible for that. "My future is to prepare the boys to be ready to play on Wednesday [against Kilmarnock in the Premiership]. "We have had a poor performance and we have to show a totally different face and that is what we expect. That is my job now and what I need to do. "It was a bad day for them and a bad day for the club. I am responsible for that and responsible for lifting them to show a different face on Wednesday." Motherwell manager Stephen Robinson was delighted with his side - and with Louis Moult's finishing. "We didn't start great in terms of our decision-making on and off the ball," he told BBC Radio Scotland. "We gave them a bit too much respect and time. "Big Cedric Kipre was struggling with illness today, and I think that showed in the first 20-30 minutes. But he really dug in and probably epitomised the spirit we have in the place. "At half-time, I said that was probably our worst performance of the season, but we knew we were fitter and stronger and would keep getting better and better as the game wore on. With our fitness levels and desire, the quality we didn't show in the first half started to come through. "The two of them up there are a big threat, and as long as you stay in games, we have always got a wee chance." Motherwell march on to the final and will be hoping for a different result from their last cup final appearance. That came in the 2011 Scottish Cup's climax, losing 3-0 to .... guess who? Yes, their opponents on 26 November, Celtic. Goals from Ki Sung-yeung, Charlie Mulgrew and a Stephen Craigan own goal put paid to Well's hopes that day. Their last League Cup final appearance was also a bit of a nightmare, losing 5-1 to Rangers in 2005. Two-goal hero Louis Moult tells BBC Scotland: "I am all over the show at the moment. The adrenaline is pumping. It kicked in last night. "The keeper was running backwards and I thought 'I am going to hit it'. It is one of those where sometimes it goes over the bar and sometimes it goes in. "The whole game was so physical. It was very tough, I've got cuts and bruises all over me. But thankfully we got the breaks today. "It was feisty, but I've got to be honest, that is the way I like it. I enjoyed that." Motherwell turned down a £400,000 offer for Louis Moult from Aberdeen in the summer and Rangers manager Pedro Caixinha has admitted he too considered a bid. That decision has certainly payed off. His 10 goals this season have included two in the quarter-finals against the Dons and now another double in the semi against Caixinha's side. It is unlikely Well will be able to hold on to the Englishman for much longer, but what price a winner against Celtic in the final too? They have already knocked out the two sides regarded as second and third best in the country. Why not now the best? Louis Moult's double takes Motherwell into their first cup final since 2011 and their first League Cup finale since 2005. The final whistle is greeted by a chorus of boos from the Rangers end of Hampden and one wonders what this will mean for Pedro Caixinha's future as manager with chairman Dave King seen sloping off in disappointment in the back of the stand. However, let's concentrate for now on the joy for Motherwell. Their fans, outnumbered heavily at Hampden, their club heavily outgunned in terms of resources, will be the ones returning to the national stadium to face Celtic in the final on 26 November. Bruno Alves is going about trying to kick Louis Moult. The Portugal defender has been owned by the Motherwell striker and can't handle it. We are half way through four minutes of stoppage time. Surely no way back for Rangers now. Motherwell make a time-wasting substitution, taking off Ryan Bowman and replacing him with fellow striker Alex Fisher. Rangers defender Bruno Alves is fortunate not to be sent off as he kicks out at Louis Moult after the two hit the ground after colliding in mid-air. Moult is pushed over by Rangers Eduarrdo Herrera and it those two who find themselves being shown yellow cards instead. Well goalkeeper Trevor Carson does well to hold after Alfredo Morelos sends a header towards the far corner. Ryan Bowman lashes over from 12 yards as Well threaten to extend their lead and with Rangers on the ropes.